Cori Calvert & Brian O'Callaghan. Did you hear the one about the American tourist who walked into an Irish bar? It sounds like a clichéd joke, but I can assure you, the punchline is nothing to be laughed at. This unlikely meeting between Cori Calvert, who indeed walked into a bar in Co. 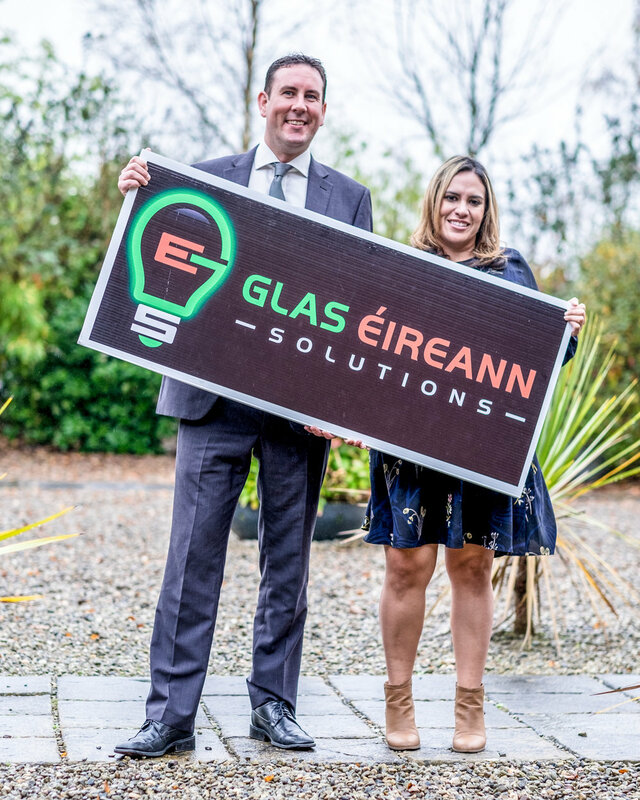 Limerick whilst on holiday in 2016, and publican Brian O’Callaghan resulted in the formation of Glas Éireann Solutions. There were of course a few steps in between …. You see, it was during this very first initial casual conversation, that both Cori and Brian realised they had a common interest in increasing energy efficiency for SMEs, albeit both for very different reasons. Cori, a Managing Director with an environmental agency in the United States Federal Government was striving to be true to her roots in focusing on the environment, whilst Brian, a hardened businessman, was searching for ways to reduce overheads so he could direct his spare finances on expanding his business and creating employment. It took many months of meetings, skype calls, emails and phonecalls before they realised the enormity of the potential of the idea they had stumbled upon. It dawned on them both that they were about to bring the ESCO (energy service company) business model to Ireland. And it was then that the hard work started! You see, although Brian always saw the merits of energy saving measures, he could never justify the extensive capital expenditure needed. With that in mind, the team set about structuring a business model which would include finance, meaning ZERO capital outlay from their clients. Next it was to Cori and her wealth of technical knowledge. Quickly realising that this model would only work if all different energy areas of the SME could be targeted, the team got to work on identifying technical equipment which would guarantee savings of up to 60%. From here, throw months of work on market research, finding suitable office space close to the University of Limerick, recruitment, legals, finances, and many many kettles of water, and the result is a complete one stop shop ESCO, ready to revolutionise the Irish market, saving Irish businesses millions on their energy bills, whilst significantly lowering future energy price risk exposure without costing the businesses a cent in capital outlay. GES was founded in 2017 by Cori Calvert. In her previous role as Managing Director of the United States Federal Government Natural Resources Conservation Agency she has spent twenty years gaining experience in the environmental market leading State of California as well as the Caribbean. She possesses practical knowledge of the most up to date technological advancements in the environmental and energy conservation fields. Brian O’Callaghan is a highly motivated professional with a twenty year track record of profitable small business ownership. Brian has outstanding interpersonal, negotiation, and mediation skills and consistently works under pressure. Brian possesses business expertise in areas ranging from business administration to recruiting and training staff. 20+ Years Experience in Energy Service & Energy Performance Contracting. 30+ Years Experience in Environmental & Energy Conservation Fields. Global Experience Covering 4 Continents. SME Ownership Background – We’ve been in your shoes! Local roots – our founders are Limerick based and are very active in the Local Community.